Most of the following pictures were taken in a 20 hour period in August at Tuolumne Meadows campground, Yosemite National Park. The evening had completely clear starry skies. At a little before midnight it started drizzling and then it poured. Many people did not have good tents and had to cover them with an extra tarp or plastic sheeting. There are dozens of varieties of cheap tents and the prices are very tempting. If you were only going to use it for the kids to sleep out in the backyard, or if you were certain that it would never rain when you camp out, you could get away with buying one. 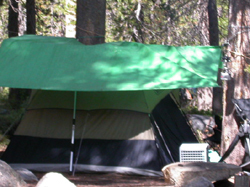 A good tent has a full rainfly that goes all the way down the outside of the tent. The one below also has a vestibule, or mini covered front porch as well. This family camps in luxury with a good tent and a screenroom for the dining table. 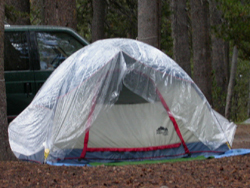 Cheap tents have only a partial, cap-sized rainfly. Rain soaks through all the tent roof not covered by the rainfly and drips into the tent. This can happen fairly quickly. The tent and rain fly should pitch taut. There should be a small amount of air space all around between the fly and the tent when it is pitched. Some of the people in the campground that night did not have a tarp to cover their cheap tents and moved into their cars until daylight, then packed up and went home. Most people packing up also did not have rain jackets and did their packing in a drizzle as their sweatshirts got slowly soaked. Some people must have used their tents previously and knew they would leak, because they came prepared with an extra tarp set up as a rainfly. Someone was a perhaps a little overly prepared, as this tent looks like a good one with a full rainfly underneath the tarp. One family had what looked like a good tent, but didn’t take the time to pitch the rainfly on top. If they moved fast enough that night they might have stayed dry. One dad slept outside so the family would have more room in the truck/camper. He might have made it inside before he got too wet. The family below had a great campsite set up with a dining canopy over the picnic table and playpen, and raft for fun, but the tent didn’t have a full rainfly. They packed up the next morning and the kids who had been playing on the river the day before got their vacation cut short. 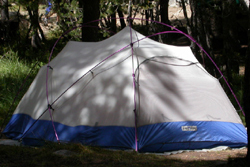 Below is a photo of a really good tent, the right shape to shed snow or rain and with a rainfly that goes all the way down the sides. But to protect the bottom from rocks the user put a big blue tarp under it. The problem is that the tarp sticks out a ways from the sides. So if it rains, the rain will run down the sides and create a big puddle on the tarp. It’s better to custom cut a thick plastic bottom protection that fits completely under the bottom of the tent. 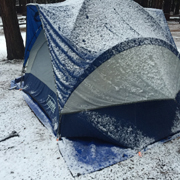 On the 2017 winter Yosemite trip these people pitched their tent incorrectly. (Many tents have instructions printed on the bag, did they read them? If they borrowed it from someone did they ask for instruction on how to pitch it? Did they try pitching it before the trip?) When they were having difficulty with it they did not ask other more experienced campers they were traveling with for help. In the dark, from a distance, it looked to the other campers as if they were okay. They were found trying to sleep in their car in the morning and complained that their tent was “unstable,” as if to say it was a fault of the construction/design of the tent, rather than their failure to properly put the ends of the rain fly tent poles into the ring pins at the base of the tent. As far as the rest of the group could tell, it looked as though they had just stuck the ends of the rain fly tent poles in the snow. 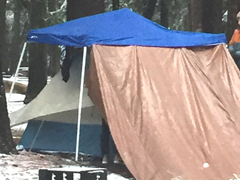 And here, a tent on the second day of a winter Yosemite trip, the occupants said their sleeping bags were already getting moist. You can see why: the sides of their tent stuck out beyond the rain fly overhang, and they had pitched it on a tarp that stuck out from the sides and collected rain water that seeped in though the tent bottom. On this second day of the trip it started snowing, adding to the accumulation of water inside their tent. If you’ve been drinking enough water to stay healthy, you will need to get up in the middle of the night. 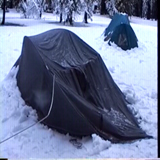 This gives you an opportunity on a winter trip to check the tent for snow accumulation. A little insulation is okay, but knock a bunch off if it’s been snowing heavily. 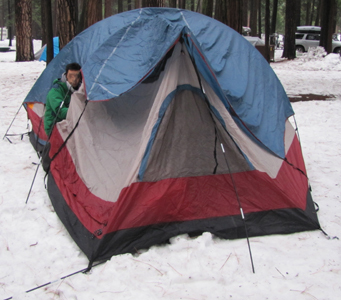 On one De Anza Outdoor Club trip a tent collapsed from too much snow (no one was hurt). Camping solutions for women answers typical questions. 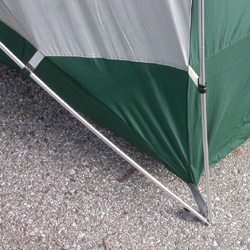 For a laugh, Camping Blunders has tales of tent mistakes.